Never pick up or capture a snake unless you are positive it is non-venomous! That said there are only a couple of venomous snakes in NY. 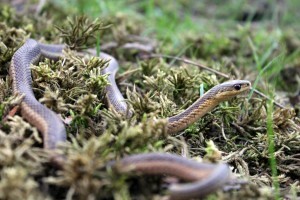 In the Rochester, NY area you will mostly see the common garter snake. 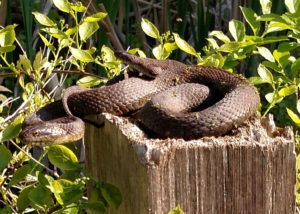 Snake control is more about making the area a place that snakes would not want to consider home. Make sure tall grasses and weeds are trimmed. All plants should be at minimum 1 foot away from the foundation of your residence. If you are getting snakes in your residence it is pretty safe to say that they are after either insects or mice that have also gained entry into your residence. To keep snakes out you should make sure your residence or building does not have holes in the foundation that lead into the building itself. Need a snake removed? If you have a snake in your home place a bucket or garbage can over if you can. If it is in a room close the door and make sure to place a towel at the bottom of the door so it can not make its way into any other areas of the residence. Then Give us a call. We offer 24/7 Emergency removal services in Rochester, NY and all of its surrounding areas. Snake Proofing: Do you keep finding snakes in the house or business? Give us a call and schedule a inspection Today. 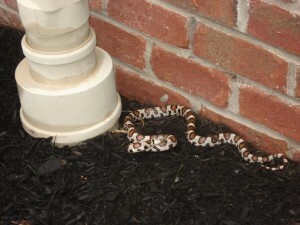 Chances are pretty good that we can snake proof your residence or business. Some residences and buildings however do not make good candidates for snake proofing. This happens if the foundation or structure is in need of substantial repair. Below is a list of snakes that are found throughout NY. Found throughout NY. The Eastern Milk Snake is found throughout NY. Usually a docile reptile but will bite. This snakes range in sizes from 24 inches to 54 inches when mature. they can be seen in various color variations with similar markings. I have seen them in brown and white, red and white, and gray with slight orange markings. Found throughout NY. Typically docile in nature. Size ranges from 18 to 26 inches when mature. Found throughout NY. Typically docile, but will bite if provoked. Size ranges from 9 to 13 inches in length when mature. Found throughout NY state. This snake ranges in size from 8 to 16 inches when mature. Typically docile but will bite if provoked. Found throughout NY. Another docile in nature snake. Size ranges from 10 to 15 inches in length when mature. Found throughout NY. Docile in nature but will bite if provoked. Adults range in size from 14 to 20 inches in length. Found in various areas of NY. This is the largest snake reaching lengths of up to 8 feet when mature. Although its rare to find in NY they do reside here. Mostly near streams with good populations of crayfish. Adults may reach a length of 15 to 24 inches. It is listed as an endangered species in NY. Found throughout NY. This is a aggressive snake and will bite if handled. Size ranges from 24 to 55 inches when mature. Mostly found by ponds and streams. Will try to evade human interaction if approached, but will stand its ground if cornered or feels threatened. Rare but can be found in Onondoga and Genessee counties of NY. Mature adults range from 18 to 40 inches. A shy elusive snake. It will avoid biting unless cornered, stepped on, or handled. The largest venomous snake in NY. Can reach 5 feet in length. A timber rattlesnake will not pursue or attack a person unless threatened or provoked. Rare but can be found in lower Hudson Valley, parts of western New York, and the southern Adirondacks. The copperhead is mainly found along the lower Hudson Valley south of Kingston and scattered through the Catskills. Can reach lengths of 2 to 3 feet. Young copperheads have a yellow tail, that they use to attract pray.